Not too long ago, it was reasonable to believe that Gorillaz were done forever following the release of 2005’s Demon Days. Damon Albarn seemed to have moved on to his various side projects and Blur’s reunion, and artist Jamie Hewlett said he became bored with drawing the band’s characters. Then, of course, the duo released Plastic Beach, an album that turned the idea of Gorillaz into less of a virtual band and more of a collaboration of artists all organized by Albarn and Hewlett. But without warning in late 2010, the group that once took infamously long between releases became prolific as Albarn announced The Fall (named for the season it was recorded in) to be released on the group’s website on Christmas Day. Recorded and mixed on an iPad during the American leg of the Plastic Beach tour, The Fall continues the shift in focus to the musicians themselves, with no real accompanying animated story to its release. 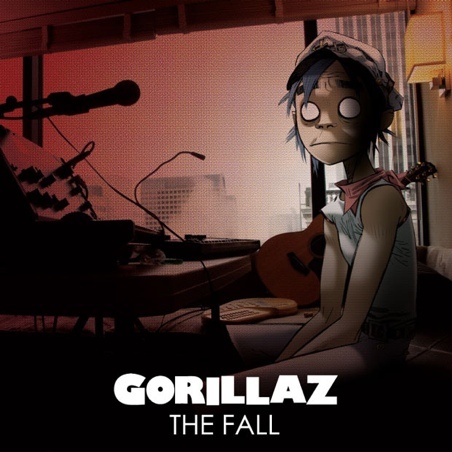 It doesn’t matter that a wide-eyed 2D is recording in a hotel room on the cover; no one’s hiding that it is really Damon Albarn sitting there anymore. But while the album was recorded while performing Plastic Beach material, it could not sound further from that album. Gorillaz have instead released a largely instrumental electronica album, one that still takes cues from left-field hip-hop and trip hop but veers towards different styles of contemporary dance music. It’s the most moody and atmospheric portions of past Gorillaz records extended to album length. In short, other than the tracks where Albarn sings (and even sometimes on those), this hardly seems like a Gorillaz album at all, and the only real collaborations here are a vocal from Bobby Womack and some guitar and bass work from The Clash’s Mick Jones and Paul Simonon who were touring with the band anyway. Like many albums written on tour, The Fall takes influence from the cities the group performed and the act of travel itself. Songs are primarily named after the place where they were recorded and lyrics (when they appear) are often images of moving. Compared to other Gorillaz albums, it’s a bit thin sounding—to be expected considering it was made mostly with iPad apps—which makes it a bit slight and unmemorable at times, especially considering the album is almost entirely production work. The Fall may be Albarn and co.’s least accomplished yet, but a lot of people won’t really consider this a “real” Gorillaz record anyway. It’s mainly a little experiment carried out by people who have a lot of fun making music, something that is more than welcome in the band’s catalog. Damon Albarn is a lot of things but lazy isn’t one of them. The last Gorillaz album, 2005’s Demon Days, spawned a couple crossover hits—especially “Feel Good Inc.”—and Albarn solidified himself as a major part of the pop world for a second straight decade whether or not he was the face of the band. But rather than rest, he released The Good, The Bad & The Queen with his British supergroup in 2007 and then wrote the music (and again collaborated with Gorillaz artist Jamie Hewlett) for Monkey: Journey To The West, a Chinese opera. If Blur’s last album, 2003’s Think Tank, seemed dominated by Albarn’s sole influence in the absence of longtime guitarist and songwriting partner Graham Coxon, all of these new projects served to confirm a change of approach—Albarn’s newfound habit of stepping out of the spotlight. It was a notion hinted at by Gorillaz’ past records, where even if he is the brains behind the operation, Albarn isn’t the face of it, or at least he shares the credit with others. So it doesn’t come as a surprise that Plastic Beach, the much-delayed third Gorillaz album, continues this trend and saturates nearly every track with diverse guest leads. This means that chamber orchestra Sinfonia ViVa, Bobby Womack, and Snoop Dogg sit alongside Lou Reed and The Clash’s Paul Simonon and Mick Jones. 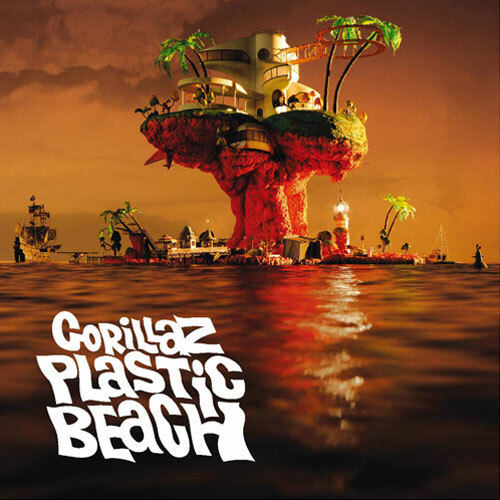 Collecting such an eclectic and idiosyncratic group of talents under one umbrella may suggest that Plastic Beach is an erratic, unfocused listen—which is occasionally true—but it is surprisingly cohesive due to Albarn’s master collaborative skills. In fact, some of the most successful moments on the album are the products of ambitious collaboration. “Stylo,” a demented electro-disco number, features an explosive vocal from Bobby Womack, and De La Soul, who previously contributed to Demon Days‘ hit “Feel Good Inc.,” return for the sweet pop of “Superfast Jellyfish.” Meanwhile, Swedish electronic group Little Dragon duet with Albarn on two of the album’s most gorgeous tracks, “Empire Ants” and “To Binge,” and Mos Def navigates the spiraling orchestration courtesy of the Hypnotic Brass Ensemble on “Sweepstakes.” Add to this the couple of tracks where Albarn sings solo, Plastic Beach offers plenty to digest in its dizzying display of talent. True, some may have qualms with the fact that Albarn himself is pushed off into the background for much of the album. After all, he is the voice of the band, and many of the songs that sound closer to Gorillaz’ past work (“On Melancholy Hill,” “Broken,” and the superb “Rhinestone Eyes”) feature no collaborations at all and are uniformly more pop-minded than most of the record. So, ultimately, Plastic Beach ends up being the least accessible Gorillaz record—this one won’t churn out a “Feel Good Inc.,” or a “Clint Eastwood”—and easily the most eclectic. But the collaborations certainly don’t hurt the record, and given the high quality of Plastic Beach, it is unlikely that any fan will be disappointed regardless of what one feels about Albarn’s new musical direction.